National Right to Life News has reported… the Trump administration is planning to fund ethical alternatives to scavenging fetal tissue from aborted babies with $20 million over the next two years. This follows a decision by the Trump administration to terminate a “one-year, $15,900 contract with Advanced Bioscience Resources to acquire human fetal tissue ‘for implantation into severely immune-compromised mice to create chimeric animals that have a human immune system,’” according to The Daily Signal. I stand before you today with a message of hope. We do not need fetal body parts from aborted babies to achieve future scientific and medical advancements. … [S]cience speaks for itself. After over 100 years of research, no therapies have been discovered or developed that require aborted fetal tissues. David Prentice, Ph.D, an advisory board member and Chair for the Midwest Stem Cell Therapy Center, talked specifically not only about the ethical issues raised, the importance of federal funding going to therapies that work, but also a number of alternatives… Read more. To a Christian, respect for the dead means that the living ought to hold the dead in loving or at least charitable memory; to see that they are given a decent burial; to “pay respects” by visiting or writing the family or attending a funeral or church service; and by supporting widows and orphans. Old Testament Israel went further to include preservation of the deceased man's line by marrying his widow to his brother or a close family member who could raise up seed for him, to honor his memory. Some of those traditions continue now, but according to a report by the National Funeral Directors Association, cremations accounted for 50.2 percent of funerals in 2016, up from 48.5 percent in 2015, and 43.5 percent of Americans opted for a burial, down from 45.4 percent in 2015. The report predicts that by 2035 cremation will reach 78.8 percent for the USA. Cremation costs less than burial and is viewed as environmentally friendly, and people are not as religious as in former decades and centuries. A Christian ought to feel a pang of guilt if he deprecates the memory of the dead —who cannot defend himself against slander etc.— or fails to weep with those who weep (Rom 12:15) or support family as needed (1 Tim 5:4). Or, if our duty is to oversee the handling of the body, we ought to feel wrong about organ sharing or cremation. We have looked at reasons why organ sharing is against the Bible, but what about cremation? Or, what about medical donation for training or research purposes? 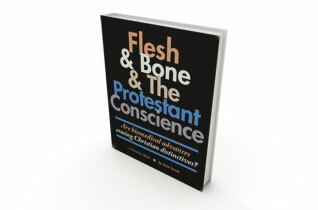 In the Flesh & Bone & The Protestant Conscience (FBPC) e-book, these are discussed. I noted that donating a body to help medical students learn or to assist in research that is not offensive to God, seems fine, provided there is an agreement to treat the body with respect. Here is an excerpt from FBPC that addresses the objection that we may not be in control of life’s end, so when we are, why be so concerned? Simply because some do burn up, have body parts cut off, or drown in the ocean, there is no reason to imitate the catastrophic in end-of-life matters. War and other circumstances beyond our control are not meant to furnish examples to us for the proper handing of body preparation at death and burial. An early biblical account of burial is told when Abraham sought to bury Sarah and would not accept a gift of land but insisted upon purchasing her grave, a cave and a field (Gen 23:9-20). That was the first real estate owned in the Promised Land, serving to mark the nation’s claim. From our standpoint, this Bible account testifies that burial is a serious matter and an investment that proves our love for the deceased and our belief in the resurrection. As well, this assisted Abraham to grieve. Can cremation help anyone to grieve? Grieving is essential to the healing of the brokenhearted. We often read of a king’s end in the Old Testament, that he “slept with his fathers and was buried with his fathers.” (1 Ki 14:31, et al) Burial or interment was the method of handling a body after death, a practice which looked forward to Christ’s resurrection, though the nation was not aware of this aspect of their witness to the world. Burial reminds those who grieve to focus instead on the Resurrection of the Lord and his victory over death, and that “in Christ shall all be made alive.” (1 Cor 15:22) As we bury our loved ones, we show we believe the Bible and look forward to the Resurrection of the saints. When we bury them whole, without missing body parts that were not lost in life’s trials, we testify that the body, too, is the person: A dead body has relation to its soul and in some marvelous, unknowable manner, will know it again at the last day. If we deny the importance of the person as an unique individual whose body is due respect whether alive or dead, do we not also disrespect the doctrine of the Resurrection— an essential doctrine of the Christian faith? How do we show our acceptance of and belief in the doctrines of our faith? We show our faith by our actions. Cremation does not show respect for the dead. Here is an article that explains how burial can cost the same as cremation.